We’d love your help. Let us know what’s wrong with this preview of Abigail the Whale by Davide Cali. Abigail’s swimming teacher takes her aside and points out: we can change how we see ourselves. He offers a creative visualizat Abigail dreads swimming lessons. Every time she dives into the pool, she makes a big splash, and all the girls in her class shout: “Abigail’s a whale!” Abigail can see that she is larger than the other girls. She feels huge, heavy, and out of place. To ask other readers questions about Abigail the Whale, please sign up. Things changes the day her swimming teacher tells her that "we are what we think", and that if she wants to swim light, she has to think light. Abigail decides to give it a try, and actually when she thinks water she feels liquid, and s Abigail hates to swim. She always tries to be the last in the line, because she knows what is coming. When she dives in her body, which she sees large, big, and heavy, makes a huge wave, and everybody starts saying "Abigail is a whale!". Oh, how she hates to swim! What a cute story, beautifully illustrated, with a hopeful message! "You are what you think" can apply to adults too, helping people overcome their fears and difficult situations. I loved how Abigail rose above the bullying, kicking out the negative image with the positive, gaining new self confidence. She's a brave and beautiful example for everyone. Recommend for younger children and up. Made me want to stand up and cheer, "Go Abigail!" (An e-book copy was provided by NetGalley and th What a cute story, beautifully illustrated, with a hopeful message! Abigail dreaded swimming class. The kids teased her for making a splash as big as a whale. Things changed when her swimming teacher taught her that changing how she sees herself could make others see her differently also. This is a cute picture book with adorable illustrations by Sonja Bougaeva. It was written in a language other than English, and was translated by Marlene Baleine. Most of it translated well, except referring to the "changing room" as "change room". I enjoyed the story until the l Abigail dreaded swimming class. The kids teased her for making a splash as big as a whale. Things changed when her swimming teacher taught her that changing how she sees herself could make others see her differently also. Ambivalent on this one. I loved the positivity, annoyed that the bullying isn't addressed. I get that the focus is on Abigail and not the other kids, but even looking at it that way the swim teacher being obtuse about why she hates swimming gets me. This is a picture book about working with what you have. In this case Abigail is fat. When she jumps in the pool she makes waves and is teased about it. Rather than telling her to lose weight, or to not jump in, or some other such nonsense, her teacher tells her to think of herself as light. "We are what we think," her teacher said. "If you want to swim well, you have to think light. Do you suppose birds or fish think they're too heavy? Of course not!" So Abigail starts imagining herself as thi This is a picture book about working with what you have. In this case Abigail is fat. When she jumps in the pool she makes waves and is teased about it. Rather than telling her to lose weight, or to not jump in, or some other such nonsense, her teacher tells her to think of herself as light. So Abigail starts imagining herself as things other than what she is. She is afraid when walking home, so thinks of herself as a giant. She has trouble falling asleep so thinks of herself as a hedgehog. She uses this power in the pool and impresses everyone. And when she wants to be a whale, she damned well does it because she wants to be. Cute story. Bright pictures. Lovely idea. Abigail is a young lady embarrassed by the way her large frame displaces the water at her swimming class. Her peers heckle her, calling her a whale. 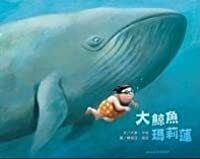 Her swimming teacher does not interfere with the bullying, instead telling Abigail to imagine that she is smaller. "...if you want to feel light, think light!" The rich imagination that this inspires in Abigail will hopefully encourage other children to excel beyond their expectations. However, it is disappointing to see the way her bullying is norm Abigail is a young lady embarrassed by the way her large frame displaces the water at her swimming class. Her peers heckle her, calling her a whale. Her swimming teacher does not interfere with the bullying, instead telling Abigail to imagine that she is smaller. "...if you want to feel light, think light!" The rich imagination that this inspires in Abigail will hopefully encourage other children to excel beyond their expectations. However, it is disappointing to see the way her bullying is normalized and glossed-over, and the story may be less than encouraging for overweight children who feel marginalized. I received this book from Net Galley in exchange for a fair review. A charming and beautifully illustrated book that touches on body issues and positive thoughts of ourselves and our abilities. The paintings are quite lovely. I loved Abigail's instructor but was troubled by the lack of consequences for the children bullying Abigail. The book's message isn't a magic bullet against bullying, but it can help a child focus on positive ways to face the world and thrive, regardless of the issue that is I received this book from Net Galley in exchange for a fair review. Having suffered bullying myself when I was at school, I know exactly the thoughts that Abigail has at the outset of this book. I really enjoyed it and wish I had been given the advice that Abigail receives. Its easy to follow and has a good undertone and overall message. Definitely one I would recommend for parents of children who are in the same position as I was all those years ago. Sadly bullying and comments like this are still common place in society, not just schools. Abigail is learning to swim but is teased by the other children for being large. Abigail's imagination allows her to take charge of her own swimming skills and oh my what a gorgeous picture book. I loved it! Although I liked the message about the power of positive thinking, it really fell short for me in that the other kids (and the reader) aren't given any lesson about why being a fatphobic poop isn't OK in the first place. I like where this was going, but I would have liked to have seen the bullying addressed. Note #1: The tone of this review is a bit academic because I did it for a children's literature course. Note #2: I am an overweight woman myself, so this informed my perspective of the book. 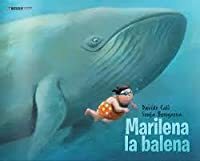 This book is about an overweight girl named Abigail, who is teased by her classmates about her size whenever they have swimming lessons, especially when she jumps into the pool and makes a big splash. Their oh-so-original nickname for her? Whale. Her swimming teacher takes her aside and tells her to use visua Note #1: The tone of this review is a bit academic because I did it for a children's literature course. This book is about an overweight girl named Abigail, who is teased by her classmates about her size whenever they have swimming lessons, especially when she jumps into the pool and makes a big splash. Their oh-so-original nickname for her? Whale. Her swimming teacher takes her aside and tells her to use visualization techniques that will foster her self-confidence. While whales are inherently good swimmers, Abigail feels the need to visualize herself as other aquatic animals, like a barracuda or an eel, to improve her swimming. It is interesting that she thinks of these two particular animals, as both are very skinny, much longer than they are wide. Abigail thinks that her size disables not just her self-confidence, but her swimming, as well. Furthermore, eels and barracudas are more vicious in nature than whales are, which implies that Abigail feels the need to fight back against her bullies. As Abigail continues to visualize herself differently, her classmates become more accepting of her and the boy she has a crush on even acknowledges her. Outwardly, Abigail has not changed – she is still heavy – but her inward change has outward manifestations. Abigail’s classmates notice that she accepts herself more now, and they treat her accordingly by accepting her. There are two problematic ideas behind this narrative. One is the presentation of peer approval as a reward for self-confidence. Firstly the approval of others is never guaranteed, no matter how secure or insecure one may be. While approval might be a tantalizing prospect for child readers who are bullied and lack self-confidence, a healthier message would be to love oneself no matter what anyone else thinks, especially if their peers' callous treatment is based on something as shallow as appearances. Secondly, the fact that Abigail needs to visualize herself differently from how she actually is discourages true self-acceptance. Visualization techniques do have merit, but they are usually involve visualizing oneself reaching a goal, not as someone completely different. Abigail goes to swimming lessons and believes that they are calling her a whale because of her size. (This is typically how I felt, when kids would say things to me.) Her swim instructor gave her a way of trying to see things differently. She finds out that when she looks at things differently, others will see her differently. In this book, Abigail finds out that her classmates are calling her a whale because of how good of a swimmer she could be. Abigail reminds me of, well, me. 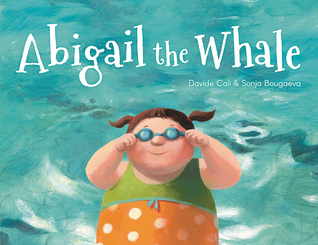 Being larger in Abigail goes to swimming lessons and believes that they are calling her a whale because of her size. (This is typically how I felt, when kids would say things to me.) Her swim instructor gave her a way of trying to see things differently. She finds out that when she looks at things differently, others will see her differently. In this book, Abigail finds out that her classmates are calling her a whale because of how good of a swimmer she could be. Abigail reminds me of, well, me. Being larger in frame makes it hard, sometimes, to trust in ourselves and others. Several teachers tried to do similar things for me, but just one perceived hurtful thing can lead those with little self-confidence back to where we once were. The book" Abigail the Whale is great to read with lower elementary students to reinforce the anti-bullying that goes on in the school system today. Awesome job to her coach giving her that positive self talk/thinking can change perspective and help us see ourselves in the way we think. YAY Abigail! She finds that what she thinks is important, and she can help herself with her life’s challenges. It is very empowering to people of all ages to learn the power they possess to make a difference in thei The book" Abigail the Whale is great to read with lower elementary students to reinforce the anti-bullying that goes on in the school system today. YAY Abigail! She finds that what she thinks is important, and she can help herself with her life’s challenges. It is very empowering to people of all ages to learn the power they possess to make a difference in their lives and in the lives of others. For a book about "bullying" it never shows kids that bullying is wrong. 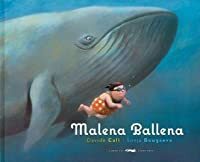 I did like that she kind of reclaimed being a whale, but this book is definitely a completely unnecessary addition to children's lit. Also, "She ate all her carrots at lunch. And Elliot smiled at her for the first time ever..." UGH WHYYY??? This book spoke out to me at the library today. What a beautiful reminder that "we are what we think." When Abigail changed her mindset, she lived a vibrant, joyful life... and she didn't have to lose weight to do it. Great lesson. I wish this book existed when I was young! Una bambina più robusta degli altri, tanto da farle diventare un problema il suo sovrappeso. Bello il finale dove la bambina arriva a scherzare sul suo probema, però mi lascia molto perplesso il metodo usato per farle superare la difficoltà. You are what you THINK! Go Abigail! A great story about name calling and naming yourself, having power and confidence, and admitting you're awesome. As an overweight kid, I would've totally related to Abigail's story. Important message about self-love. Great book for teaching mindset! "We are what we think." -- Abigail takes this proverb literally in order to overcome name calling and meanness. A cute story about building confidence in yourself in the face of negative comments from others. Es muy bueno, y algo peligroso. This is such a sweet story of how a little girl who is chubby is bullied and shamed, and how she learns to not let it hold her back.